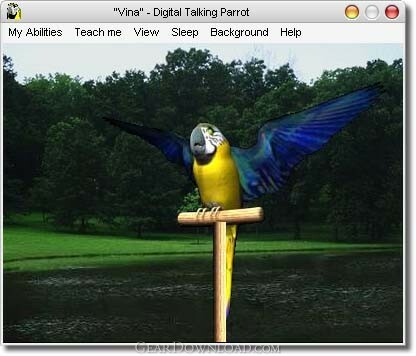 Digital Talking Parrot is the first intelligent, interactive screensaver. This cute and friendly animated 3D Screensaver is based on the latest multimedia technologies in voice changing. Parrot can talk, laugh, and sing. It can also mimic bird songs and repeat the words or phrases that you teach it. Parrot remembers whatever it hears and will repeat it later in a funny voice that you can alter. You can teach Parrot to talk with different voices, and decide which words it should remember, and which it should not. You can choose the background from 5 different wild nature scenes, including a lake, a waterfall and a wind scene. By changing the pitch and vibration of Parrot's voice, you can make it talk in the funniest voice to entertain you while you are not actively using your computer. Digital Talking Parrot runs well on Windows XP or higher operating systems. This is a free screensaver and will be a lovely addition to anyone's computer and will add fun and entertainment to anyone's day. This download (dtparrot-aff.zip) was tested thoroughly and was found 100% clean. Click "Report Spyware" link on the top if you found this software contains any form of malware, including but not limited to: spyware, viruses, trojans and backdoors.